Some dead slaughterfish can also be found in some dungeons. 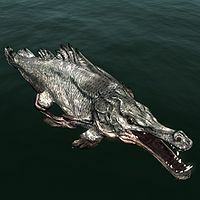 Their corpses may be looted for slaughterfish scales, while their eggs can only be harvested from clusters found underwater. The eggs can be used to breed non-hostile slaughterfish in the fish hatchery at Windstad Manor with the Hearthfire add-on installed. This page was last modified on 25 November 2016, at 17:46.